The digital version was recently released to the Google Play store, iTunes store and Steam. The story/concept of the game is the same. There are some murders which have taken place, and a bunch of psychics has been brought into to commune with a local ghost in order to divine the who, where and how of the crimes. The ghost sends images to the psychics who then must try to determine the meaning of the pictures. There are a number of different modes here. 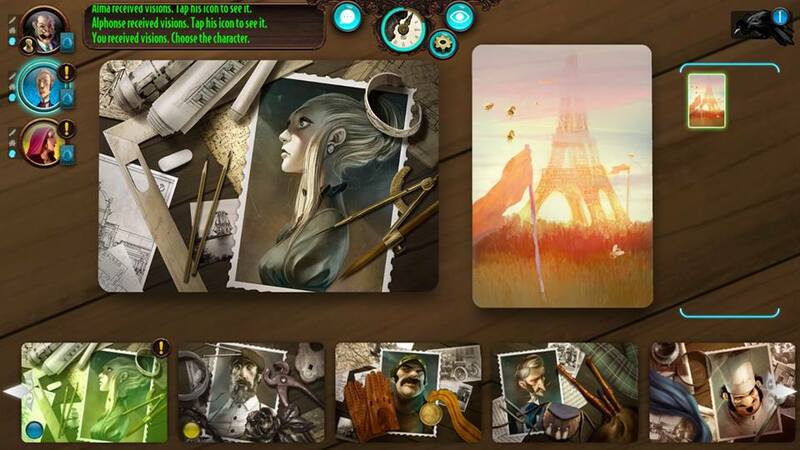 First is the story mode – this is a set of cases that is supposed to teach you how to play the game. As you solve the current case, you are allowed to move onto the next one in the series. You theoretically learn how to be both the psychic as well as the ghost here. You also are supposed to learn how to use clairvoyance points. However, if you aren’t familiar with the board game, I think this would be a tough slog to learn how to play. There doesn’t seem to be enough written instructions to figure out what to do. However, it is hard for me to judge this as I already know the rules. I didn’t bother to finish the whole series because this solo version just didn’t do much for me. So, onto the multiplayer versions. You can choose to play online – logging into your free Asmodee Digital account – you are transported to a lobby where you can see the games that are currently being set up. The games are played real time, and you can join a game that matches the options that you want to play in (number of psychics, whether you’re a psychic or the ghost, clairvoyance points or not). Depending on the time of day, there are sometimes not a lot of options to choose from. Once you get started though, the game moves along fairly well. However, trying to play the game on the phone is a difficult experience. It’s hard to see the pictures – though they do provide a magnifying glass tool which works well. It is possible to flip between psychics to see what clues they have been given, but it’s a lot of clicking back and forth, and at least for me, not so easy to take it in at once like you can on the table. Also, without the ease of vocal chatter, it doesn’t have the same community feel for me. I also found that if the app closed for whatever reason – including my screen timing out and going to the lock screen – that would sometimes boot me from my game. After two attempts at this, I frankly had enough. There is also a solo version where you can be any number of psychics and play with a computer ghost. It works well enough, but there isn’t a game here. You just click on things and hope that you’ve guessed right. In my three or four attempts, I couldn’t find any reasoning or pattern behind what the AI was choosing for the visions, and therefore, there was nothing that I could base my own guesses upon. In the end, the graphics are beautiful and the music is OK, but the gameplay is awful. There just isn’t a game here in the solo versions, and even when you can get the multiplayer version to work (and keep all the players in the game to the end), it’s still just coming down to guessing. There is no feel of teamwork or community, and since you’re likely playing with total strangers, this should come as no surprise. This is the type of game that would really only work well in person, and my experience with the phone version so far makes this abundantly clear. Stick to Candy Crush on your phone when you’re by yourself, and play Mysterium at game night when you’re with your friends. 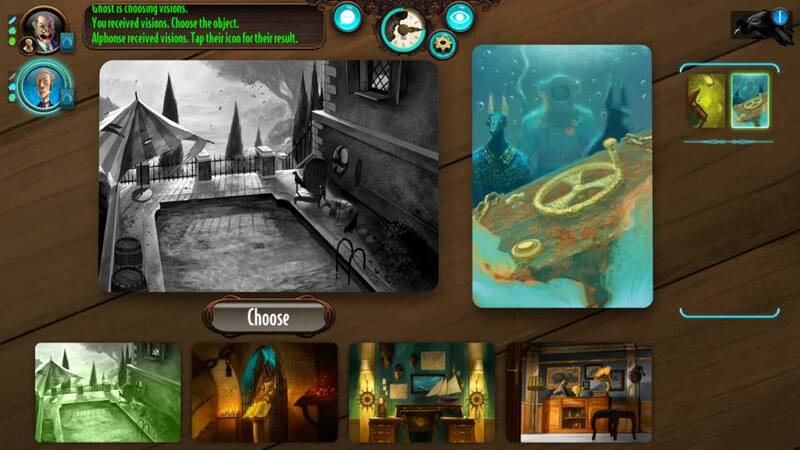 Eric E: I made the purchase of Mysterium based on my love for the board game. I really wanted the digital version to be a good representation of the game and I was not disappointed. I can play it online and I feel the idea of the game come across. It is not the same at all though. Having to type chat makes sharing ideas hard. It also isn’t always with English speaking players and there isn’t a way to filter the online by language that I have found. The one part I was baffled by was the solo mode. As Dale says it is impossible to learn and get better at. The AI can’t communicate with you in a way that helps you clue in on things. I am sure it was built by throwing a bunch of keywords into each clue card and keywords on the people, weapon, and location cards. I get that and know there is a pattern. But when the AI is guessing on AI clues, it must be random. It is like trying to determine which word in Zork the AI will take. Take? Grab? Steal? Which works? Finally, the ultimate answer to each solo story piece is preset. So if you fail to find the true killer just play again and pick the answer you now know. Overall it is ok but the price is astronomical for the fun factor and usability.